Dragify Discount 92% OFF – Save 92% on Dragify Website Builder. 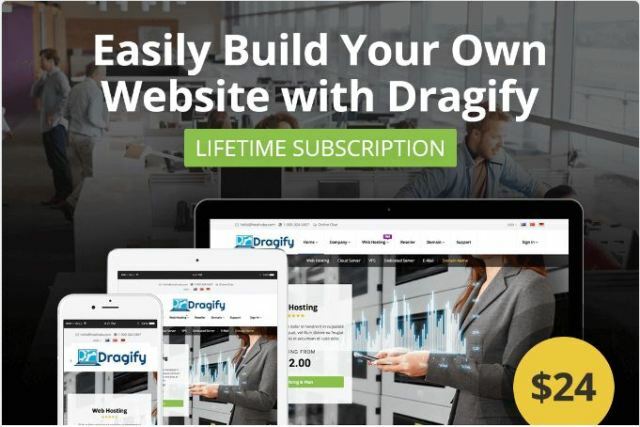 Normally, Standard Lifetime access to this amazing website building application sells for $299, but for a limited time only, you can get Dragify for a mere $24! That’s a gigantic savings of 92% off the regular price. OR get the PRO Lifetime version for just $49, instead of the regular price of $399! Note: If you’ve already purchased Dragify Standard Lifetime, you can upgrade to the PRO Lifetime version for $25 (the difference in price). Now it’s easier than ever to build your own website. Using the powerful drag-and-drop website builder called Dragify, you can put together your own gorgeous site in roughly 10 minutes! And best of all, you don’t need any coding experience! Just use any of the 44 pre-designed HTML blocks, which you can quickly customize with your own content. Mobile friendly – built on the popular Bootstrap framework. Fully customizable – easily edit links, text, images and content.